Enjoy having a semi-reasonable idea of what avisaurids looked like now. 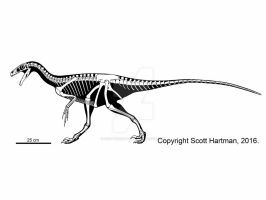 What i find very interesting is that some of Its characteristics are surprisingly dinosaurian, avisaurids feel like the perfect transitional forms between ancient more dinosaur/reptile-like birds and more modern and flight-specialized birds. I agree. That's why I strongly oppose the use of the word "bird" (unless it's part of "stem-bird") for anything below the avian crown group - it covers up all the wonderful and amazing diversity of forms between basal avialans and true crown birds as we know them. So, how would you classify Archaeopteryx? Is it a bird like dinosaur? Or a dinosaur-like “stem-bird”? i’m more inclined towards the first option. I don't like "dinosaur-like" because they are all exactly like dinosaurs. Bird-like dinosaur is fine by me. 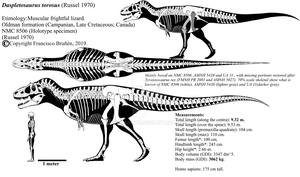 "Basal avialan" is more precise if you're talking to a fellow dinosaur-nerd. 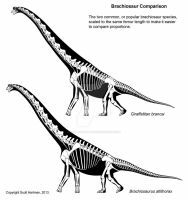 Well, yes, I stand corrected, as my terminology was a bit off, By dinosaur-like I meant reptile-like, which I think suits most large dinosaurs. 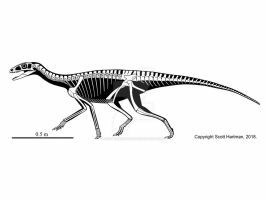 Basal Avialan May be a better term, but I think “bird-like dinosaur” pretty much describes all basal avialans, basically. I wouldn't say "dinosaur-like" because it IS a dinosaur... "bird-like dinosaur" is good. You could say all ornithodirans are "bird-like reptiles". But, my term was referring more to “reptile-like” bird instead of “dinosaur-like” bird, which I think is more appropriate wording, still, my mistake. 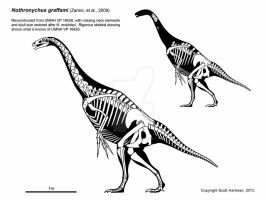 Basal avialans were certainly bird-like dinosaurs though. Does this also actually tell us about the ecology or niche that Avisaurids occupied in life? 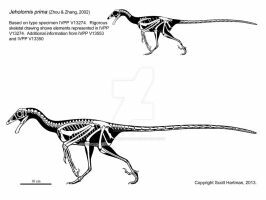 I recall from s a source several years ago that Avisaurids were considered analogues to modern raptors. Does this new specimen refute or confirm that hypothesis? I don't think it can speak strongly to dietary niche, unfortunately. We'll need even more amazing specimens for that. I can see it walking like a crow. How come this one has no teeth like the other enantiornithines? The author's feel that most of the Late Cretaceous enantiornithines lost their teeth. 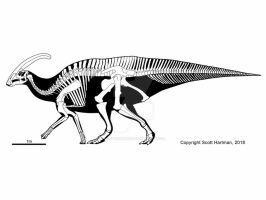 Obviously there is no skull for any avisaurid, so this is just an inference. I always thought that all enantiornithines had teeth. Great skeletal by the way! Unless I'm mistaken, gobipterygids are the only known toothless enantiornithines (and they have pointy, Confuciusornis-like beaks). Thats very interesting to hear! It is true that we lack Avisaurian skulls, but, come on, this is a bit of an extraordinary claim to make. I definitely wouldn't consider it an open and shut case. In any case, it is always good to see more Avisaurian material, and here is hoping we get some cranial elements in the near future. What would be likely niche of this animal? I used to think Avisaur as something like Cretaceous bird of prey, but lack of teeth took me by surprise. At Last! A new skeletal, GG Scott! So many new skeletals...sorry most of them are under embargo! I take it that the unpublished elements of this became Mirarce! It's not part of crown birds (Aves by most people's definition), but it's an enantiornithine, a group of stem birds that clearly were capable fliers. 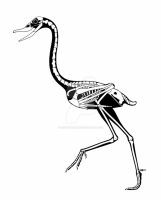 Would you happen to know if Archaeopteryx is still what we'd deem a crown bird (I guess I'm one of those people who define that as Aves)? Or is it just an avialan preceding birds proper? Wikipedia appears to suggest the latter, and so I was wondering if that's correct. A crown clade is the most recent common ancestor of all living species (and all descendants of that ancestor). Archaeopteryx is very, very far away from the crown clade. In fact, it's usually one of the most basal avialans found, and sometimes it's not even found as an avialan (though those findings are so far in the minority). Basically, Archaeopteryx is not very bird-like at all. Mirarce (and other enantiornithines) are significantly closer to crown birds than Archaeopteryx, but still quite a ways away. 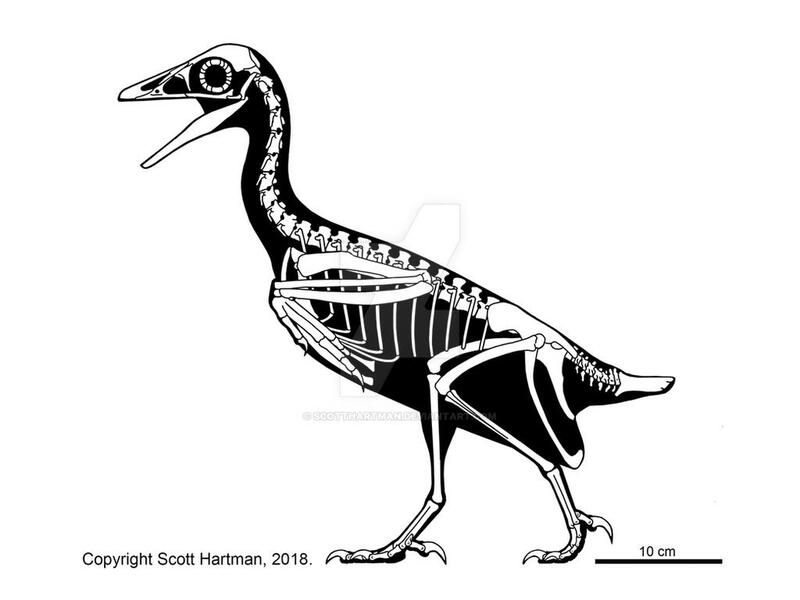 One reason I oppose the use of the "bird" in the vernacular for things like Archaeopteryx or even enantiornithines is that it tends to hide how amazingly diverse non-avian avialans actually were in the Cretaceous. Were Avisaurs good walkers? in Mr. Martyniuk's field guide it said they were specialized perching birds, and it looks more lifelike that way. I think they would have walked more like crows with their backs oriented more diagonally. Avisaurs do seem like better perching birds. 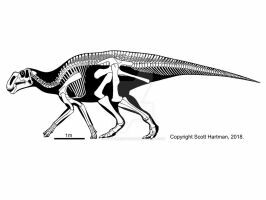 I'm less sure about the tilted body posture being habitual at this stage, but any theropod could tilt their bodies up to an angle of ~15-20 degrees if they wanted to. I call it "Angela". Do you like the name? May I ask your opinion on the idea of those animals being a sort of enant birds of prey, so to speak? This...is flat out weird. Nice art, as usual, but I have a hard time seeing this working as a living adult. Is it supposed to be a juvenile? Or were enantiornothines just strange this way? This is main good for this paleo-bird. 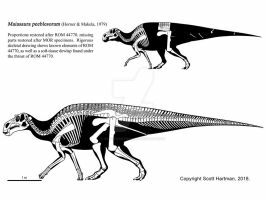 Maybe it walked like the archaic depictions of dinosaurs? What are the dimensions of Avisaurus then? Not too big, that thing....flier? Or weak? Enantiornithines at this stage are presumed to fly. How well is fair question IMO. Man am I ever late replying to this, but assuming enantiornithines didn't fly for long periods of time (e.g. they were just flapping around forests, and not migrating seasonally) then they could fly just as well for short periods having more fast-twitch than slow-twitch muscle fibers (i.e. they'd have more white meat than dark meat in the pectoral muscles). Part of the giant expansion of the flight muscles leading towards crown birds is they also increase their ability to breath while they fly - those improvements result in them being able to utilize aerobic respiration more or less indefinitely during flight, but also requires a shift to more slow-twitch muscles (that can take advantage of the constant supply of oxygen), and slow-twitch muscles are weaker pound for pound compared to fast-twitch muscles, so you need more of it. It seems like such a glaring issue now that you say this, but I've never really considered the balance of fast- to slow-twitch muscle fibers in anything other than MMA fighters. Very interesting.